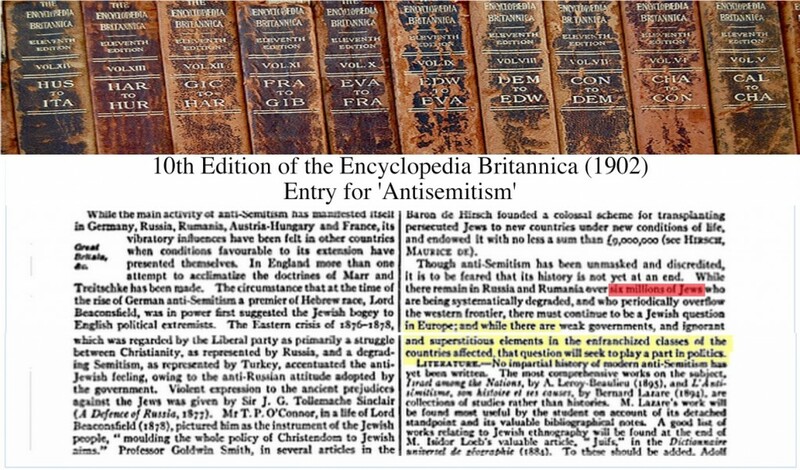 “You shall return minus 6,000,000″; Jewish scripture relates a prophecy that 6,000,000 Jews must vanish before they can reclaim Palestine as their ancient ancestral homeland. The Zionist pronouncement that kick-started the hoax of the twentieth century. 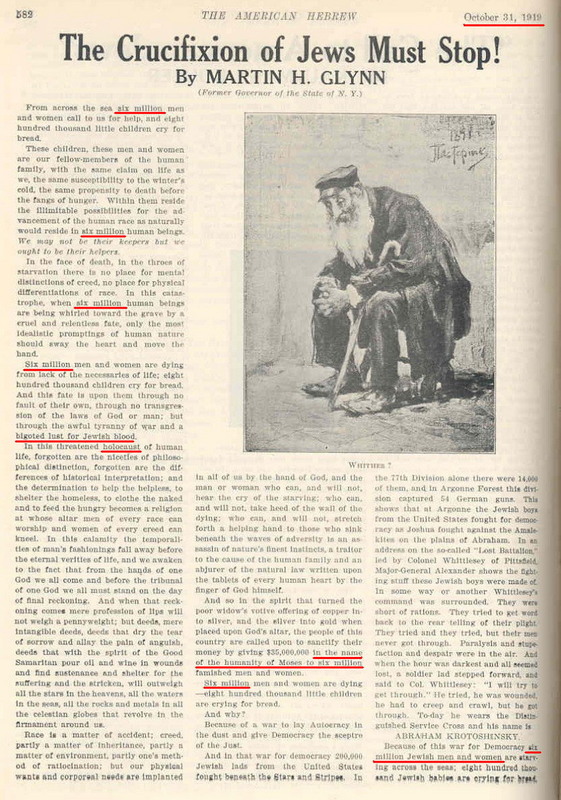 A Jewish preacher declares that if the (Jewish-led) Communist uprising in Russia succeeds in its long-time goal of overthrowing the Tsarist government, Zionism would be obsolete. 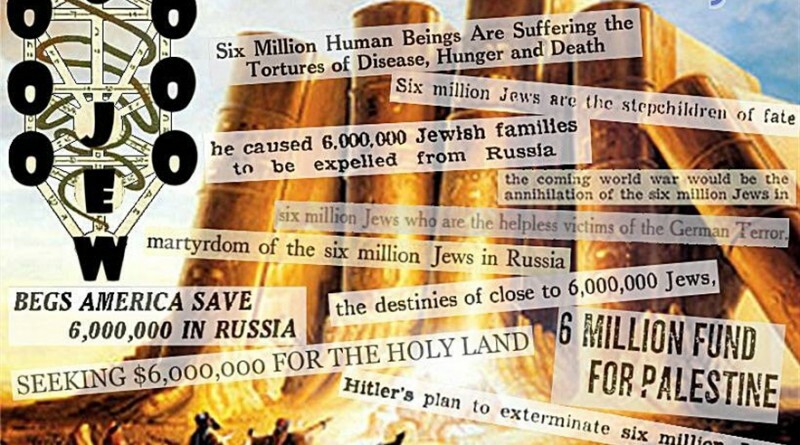 “6,000,000 Jews” is mentioned. 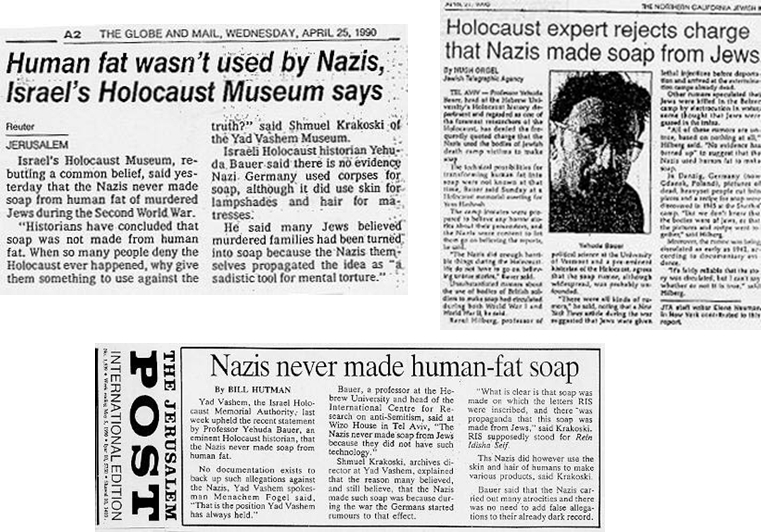 A Jewish publicist addresses an audience in Germany where he claimed that the Russian Government had a “solution of the Jewish Question” and that this solution entailed the “murderous extermination” of “6,000,000 Jews.” Of course, the Russians never had any such plans but the fictional story was resurrected during WWII with the Germans being on the receiving end of these slanderous accusations this time around. 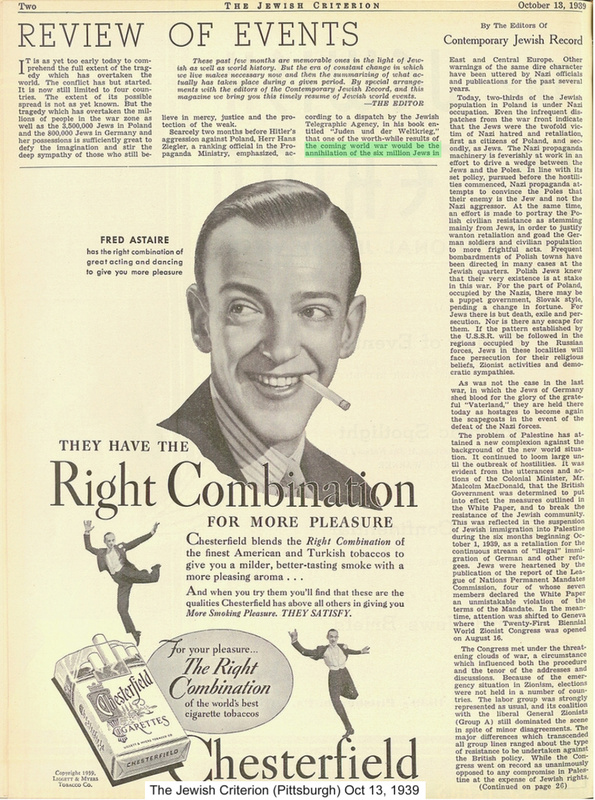 Quoted in Ben Hecht’s book, Perfidy. Hecht, a Zionist Jew himself, would go on to make the very same claim in 1943. 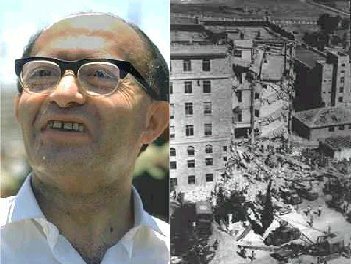 The crypto-Jewish “Young Turks” orchestrate a mass murder of 1.5 million Armenian Christians, as well as 250,000 Greek and Assyrian Christians. 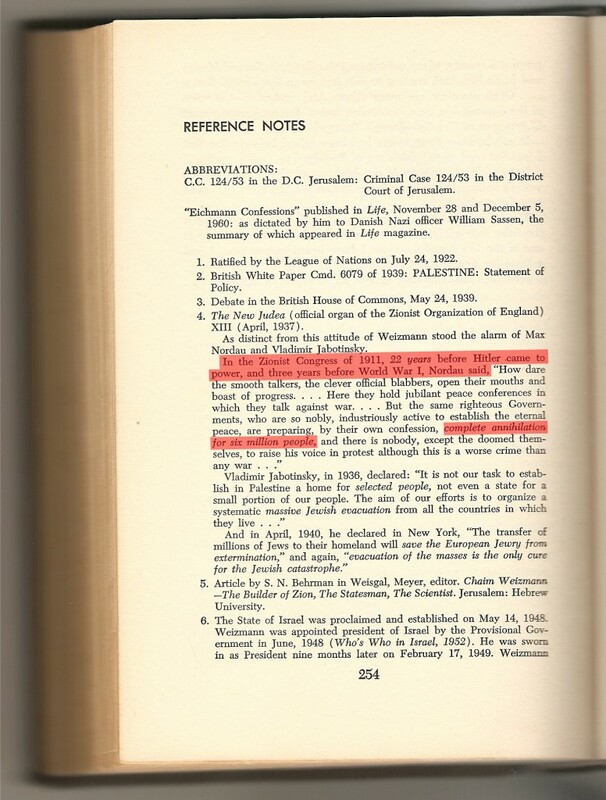 Jewish lobbyists convince the British government to support the Zionist project of making Palestine the national homeland for the Jews. 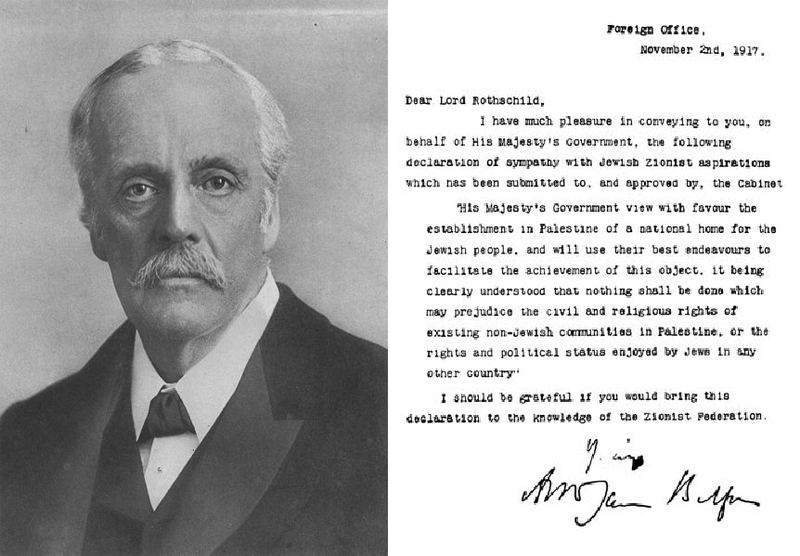 British official James Arthur Balfour decrees the “Balfour Declaration.” The letter is addressed to Zionist big-wig Lord Rothschild. 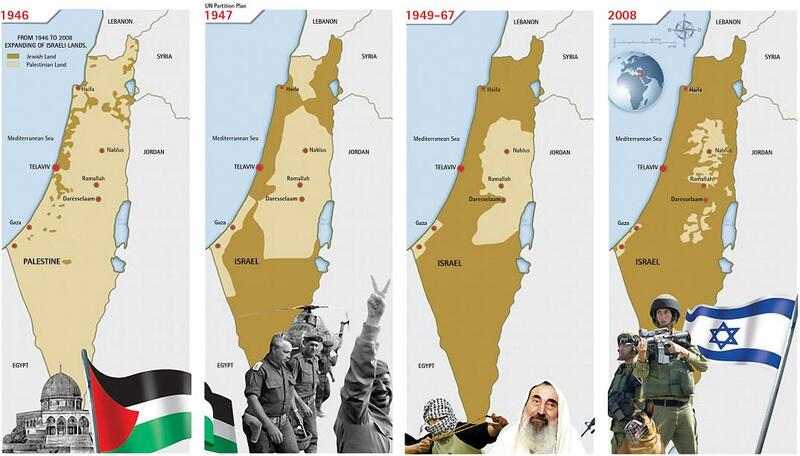 Britain becomes a deadly pawn of Zionism. 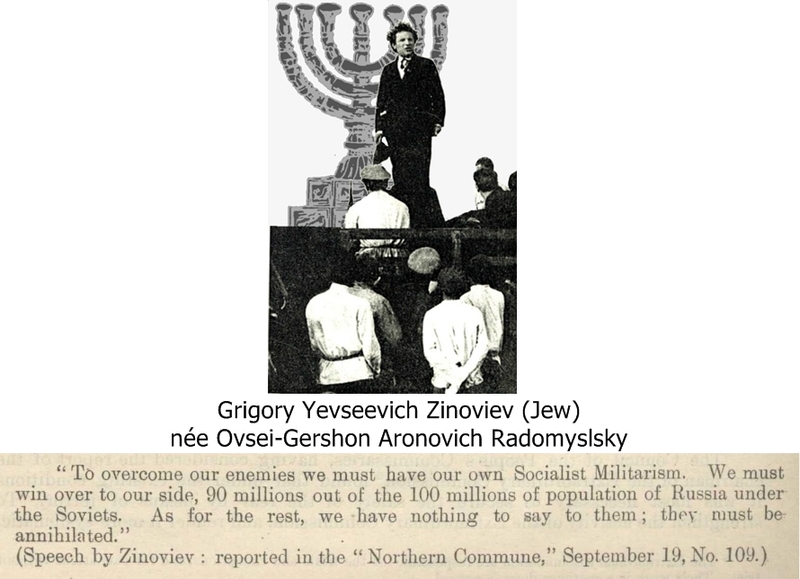 This very same year radical Jewish Marxists take control of Russia in the Bolshevik Revolution establishing the first Zionist state, the “Soviet Union.” Czar Nicholas II, along with his wife and children, are kidnapped by Jews, then shot and bayoneted. The “revolution” was led by the Jews’ Leon Trotsky, Lazar Kaganovich, Lev Kamanev, Grigory Zinoviev, Jacob Sverdlov, Moisei Uritsky, Alexander Parvus, Karl Radek, and the philosemitic part-Jew Vladimir Lenin, who all received financing from capitalist Jewish international bankers: Jacob Schiff, Max Warburg and ultimately the Rothschild’s. The Communist Jews and their pawns would go on a six decade long reign of terror. 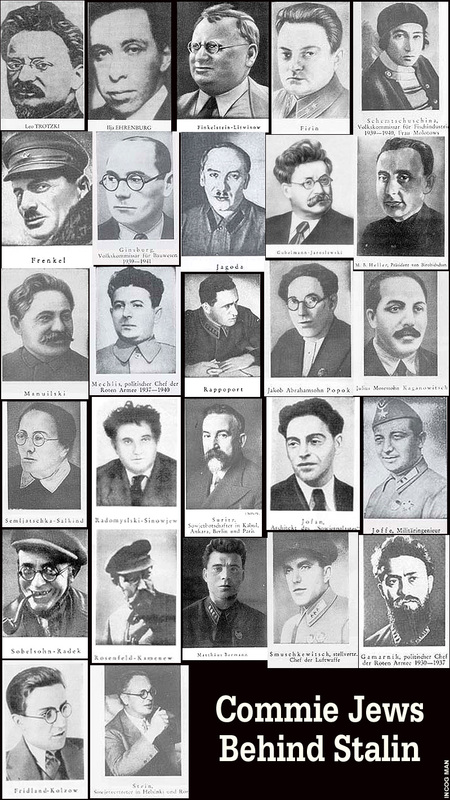 Some 40 million Russian and Eastern European Gentiles would perish in Gulags, death camps, mass executions and via man-made famines under Jewish Communist ruler-ship. 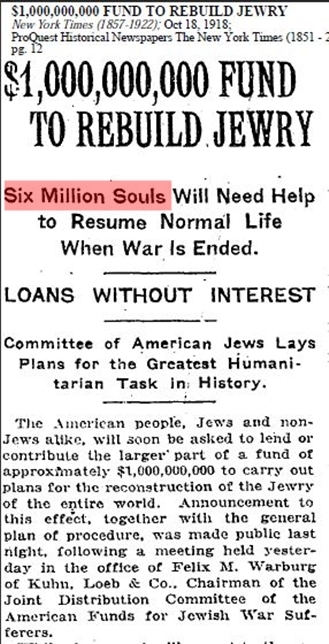 “Six million souls” need a billion dollars. This same year Jewish Communist leader Grigory Zinoviev announces plans for the annihilation of 10,000,000 Russians. 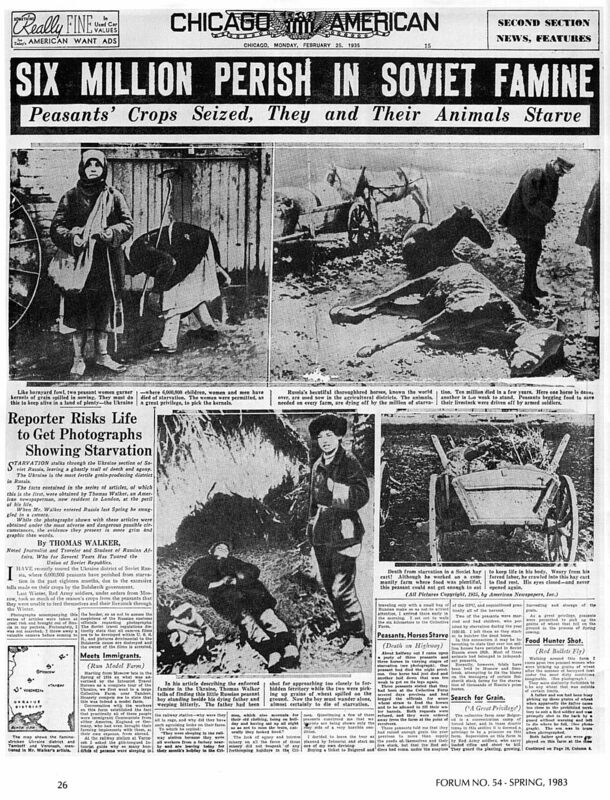 Jewish Communists plot genocide of Russians. 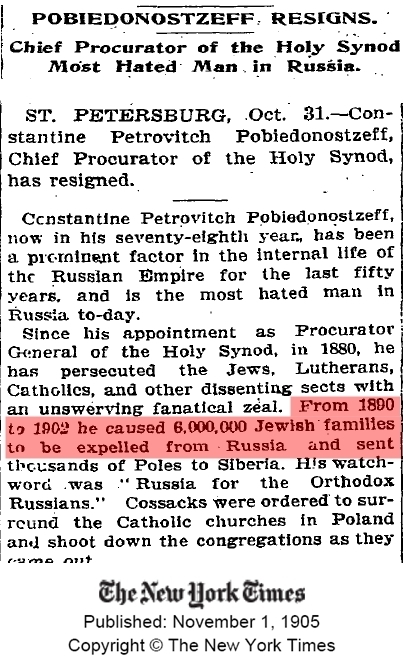 They put out stories of Jewish persecution at this same time to hide their blood-curdling atrocities in Russia. 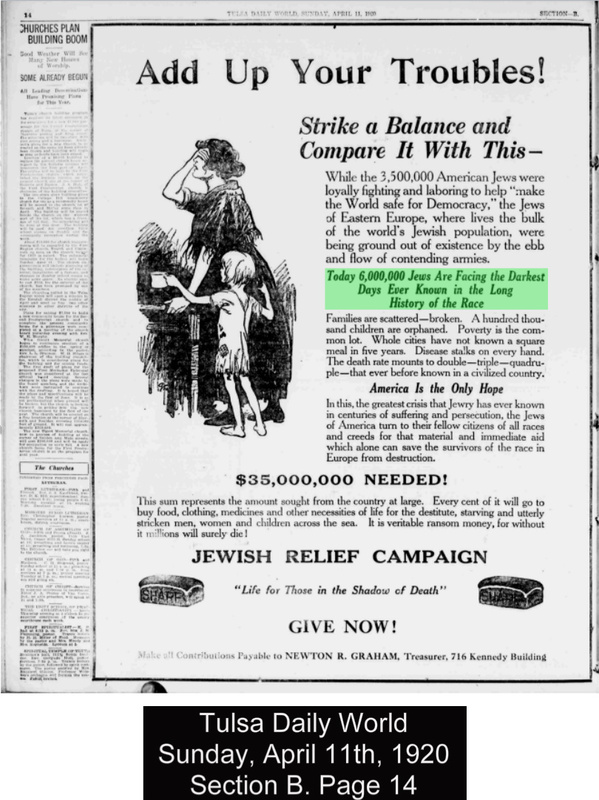 Shortly after the end of World War I hostilities, Zionists claim a “Holocaust” of “Six Million Jews” is imminent in Europe in a deceitful campaign to raise money for Jewish charities and also to distract public attention from the Jewish origins of Communism, the Bolshevik atrocities in Russia and the Armenian Genocide. 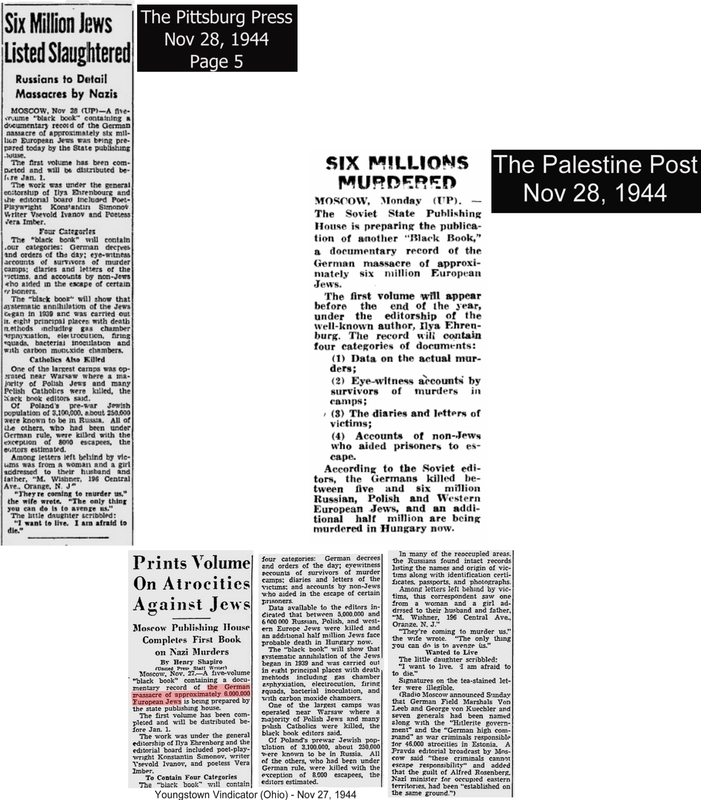 The first reported “Holocaust” of “Six Million Jews.” Nothing more than Zionist propaganda. 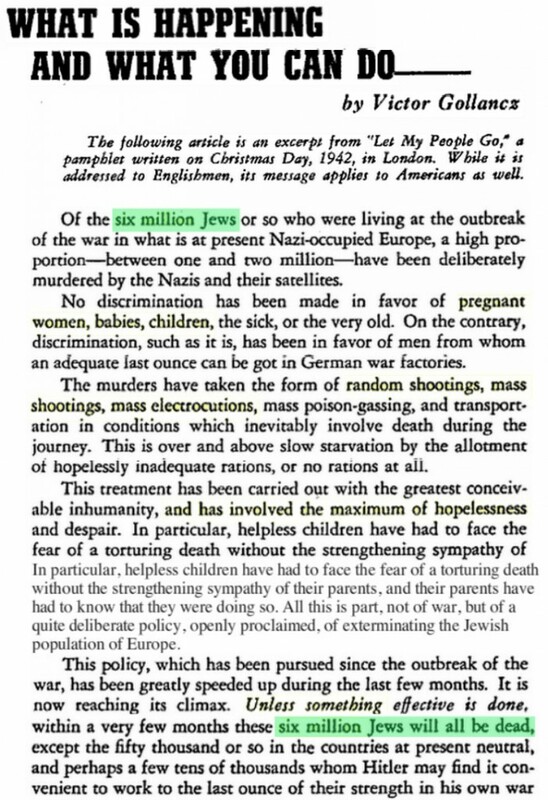 Elder of Zion Nathan Straus published this article in the San Fransico Chronicle claiming 6,000,000 Jews were in peril. 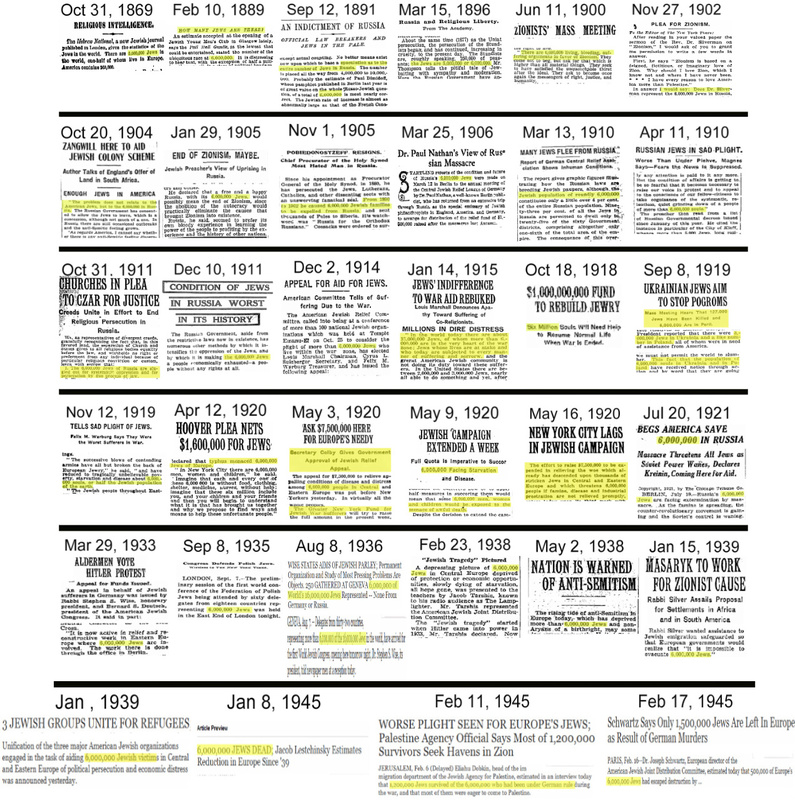 More persecution propaganda in the same year. 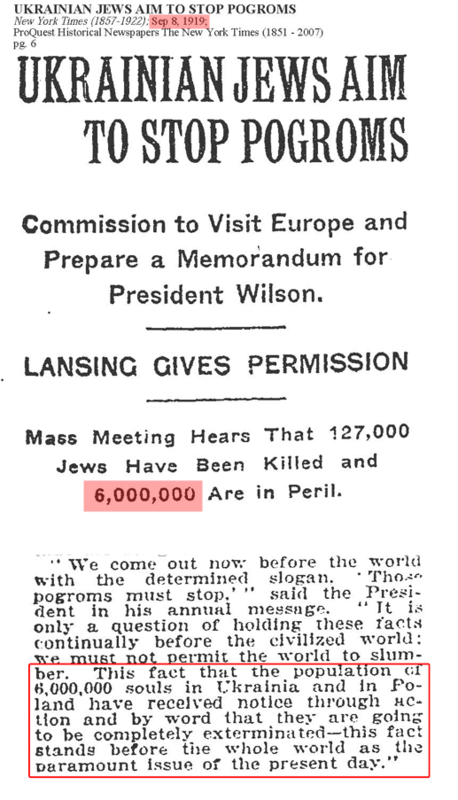 Again “6,000,000 Jews” as victims, of course. Russian patriots gain ground on the Jewish Bolshevik usurpers of their nation. 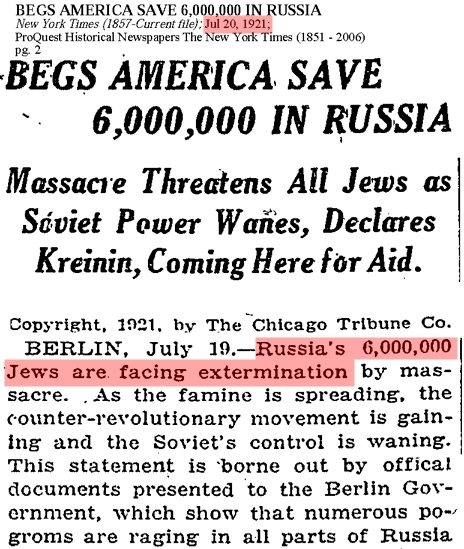 In a vein attempt to hide their heavy involvement in the brutal Bolshevist atrocities being committed in Russia, Jews reel out the “six million” myth once again. Six Million again. 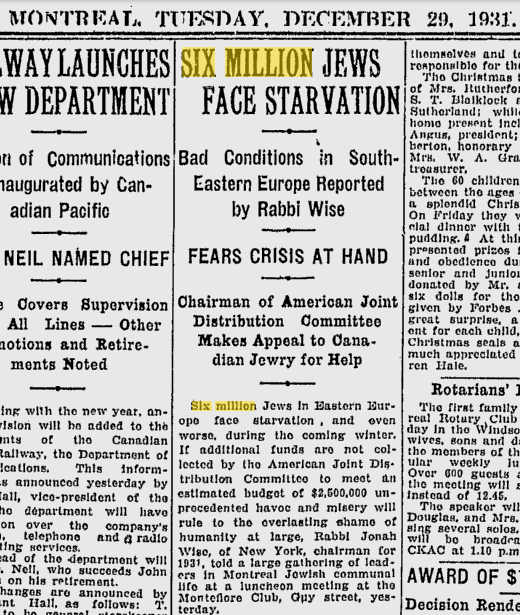 Jews demand that Gentiles hand over their food to the poor, innocent Jews while they murder millions, and ship millions more off to Gulag slave camps in Communist Jew-controlled Russia. 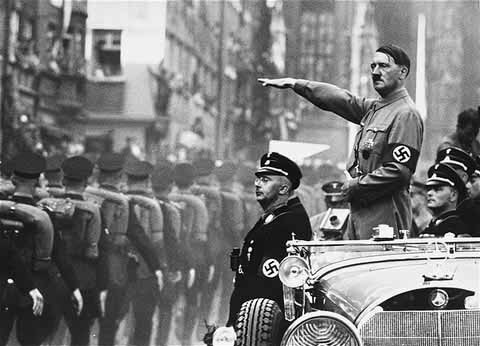 Adolf Hitler becomes Chancellor of Germany in 1933. 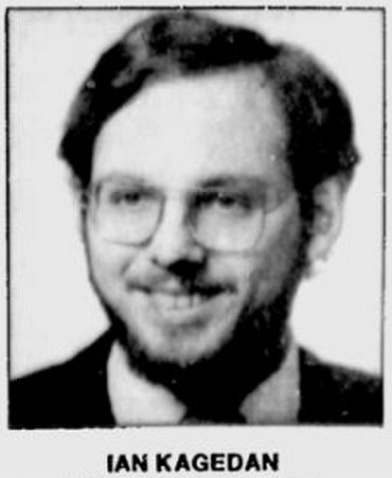 Jews immediately seek his complete destruction. Hitler comes to power in Germany. 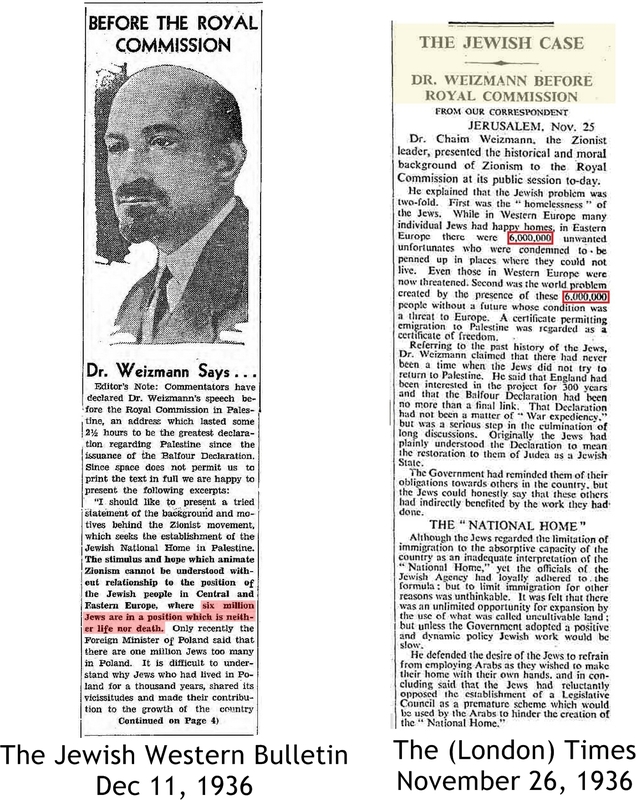 Antithetical to Jewish banking interests which thrives off of usury (the lending of money at interest making debt-slaves out of countries), Hitler immediately begins printing his own state-controlled, labor-backed currency and thus breaking the death-grip of the monolithic Jewish banking establishment of Europe, led by the Rothschild’s and the Warburg’s. Hitler also removed Jews from all positions in government, media, education and banks, which they had been dominating up until that point. 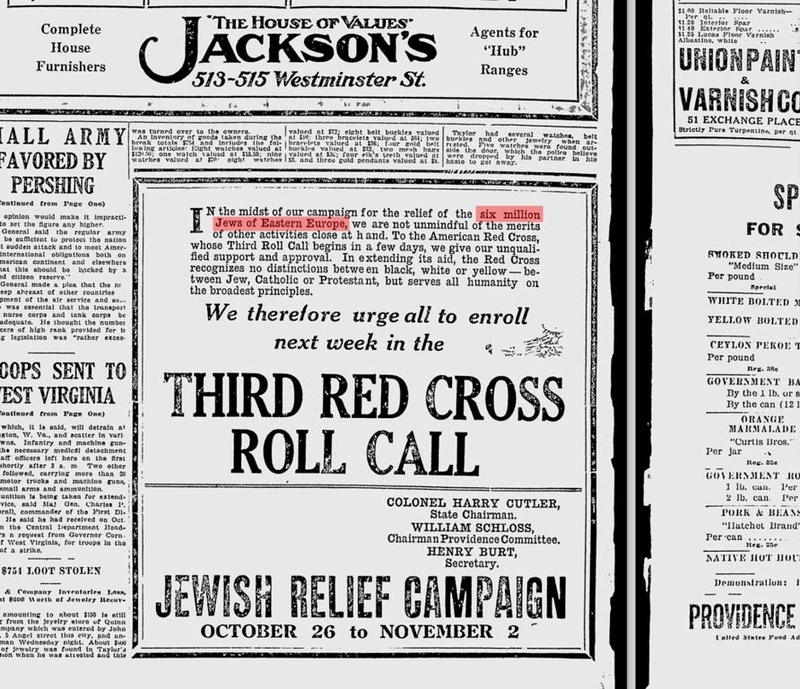 Because of this World Jewry declares war on Germany in 1933. 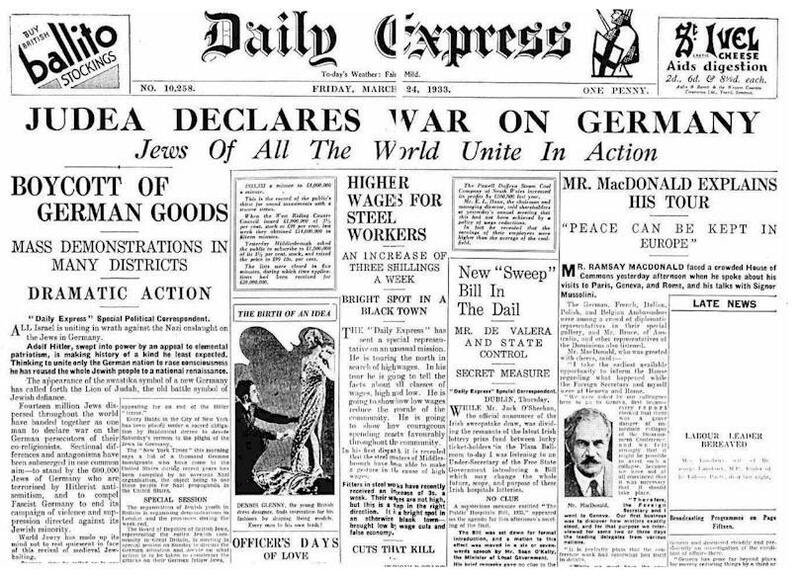 Jews around the world launched a global economic boycott of German goods in an effort to economically strangle Germany to death and topple Hitler’s new government. Jews don’t like it when Gentiles revolt against their tyranny and control. Their motto is: be our slave or be dead. 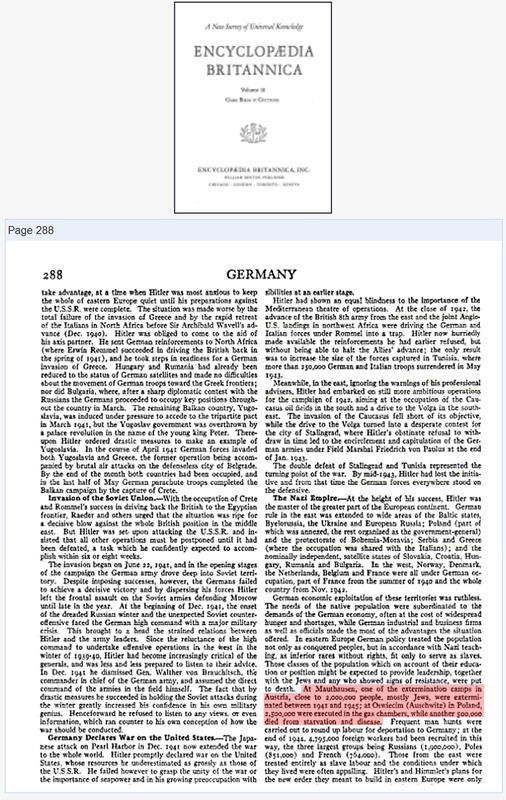 This act of treachery leads to widespread dislike of Jews in Germany and foments tension between Jews and German Gentiles. 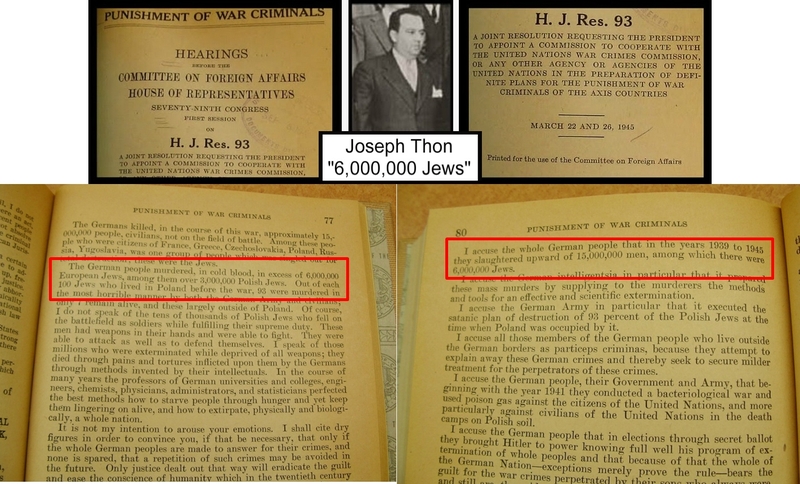 For this act, and for the Jews’ well-known support for Communism and substantial involvement in the bloody Bolshevik Revolution, the Nazis declare Jews “enemies of the state” eventually interning them in concentration camps and labor camps during the Second World War. Almost the same thing happened to Japanese-Americans after Pearl Harbor. 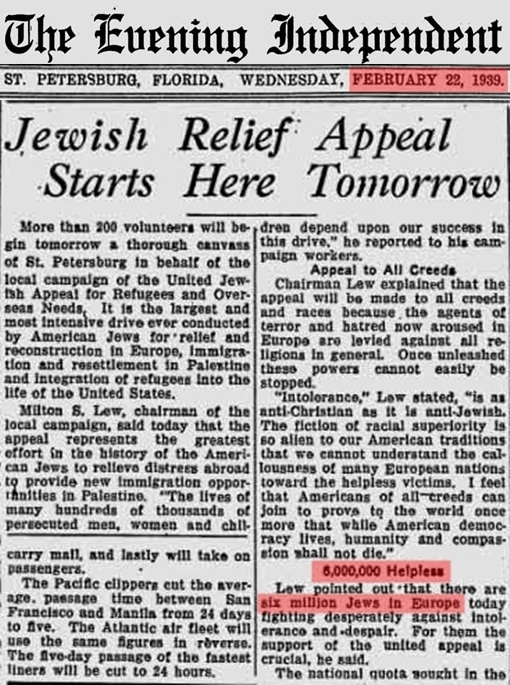 Although, unlike the Jews, Japanese people never waged an economic war on America, they were interned in American concentration camps simply for their ethnicity. Jews continue to agitate for Palestine. 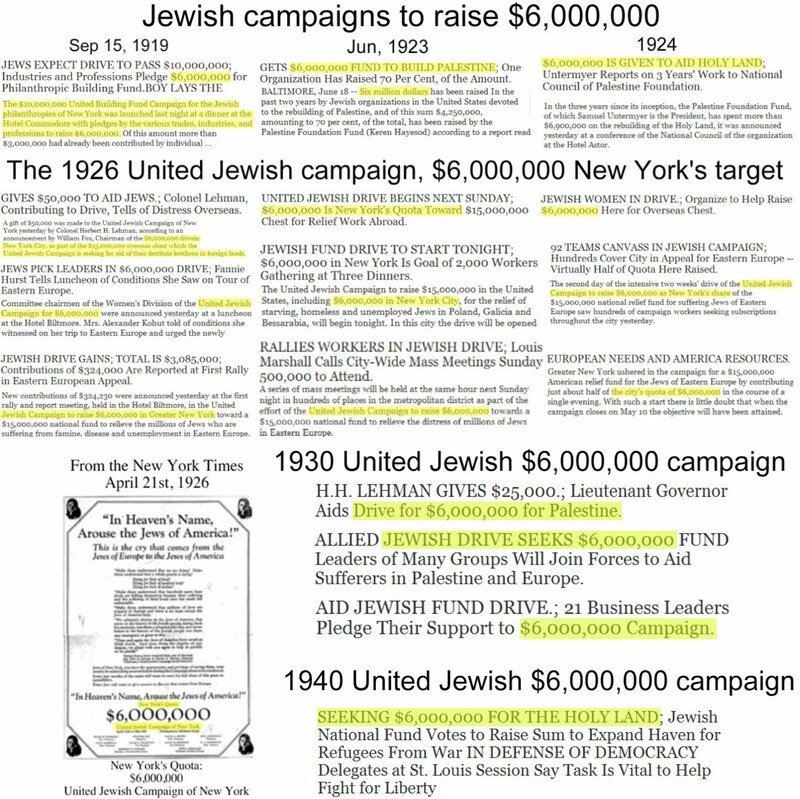 The New York Times reported that Zionist groups were desperately lobbying American Christian leaders, Christian organizations, and the British government, demanding assistance in the creation of a “Jewish nation in Palestine” to save the Jews from “the European Holocaust.” These strikingly prophetic statements were made years before the creation of ghettos or concentration camps and over three years before the German invasion of Poland. Jewish leaders meet to discuss their schemes, swindles and sinister conspiracies. 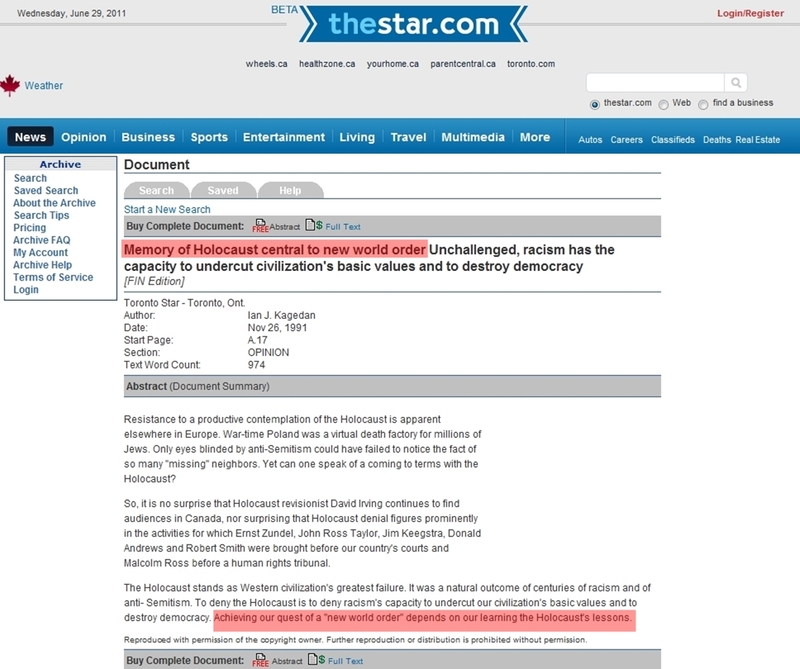 “Six Million Hebrews” is mentioned in the article title. 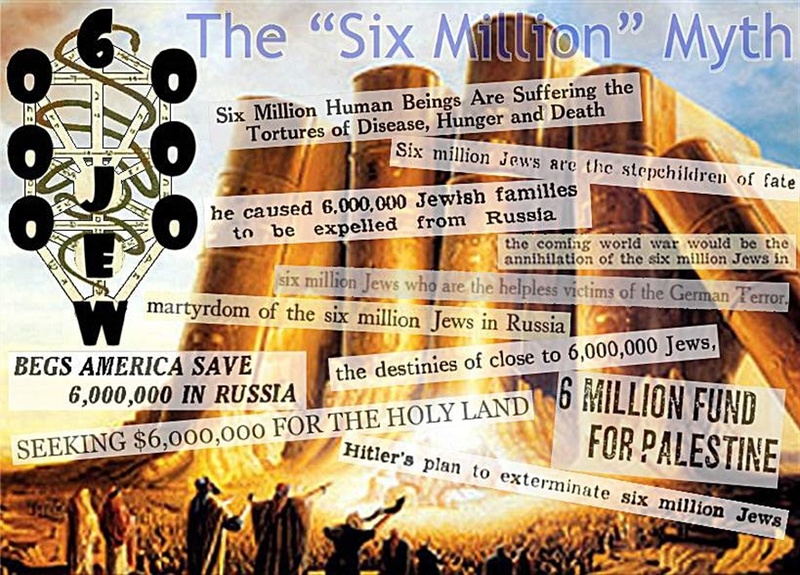 Jew propagandists amp up the “Six Million” b.s. as World War II draws closer. 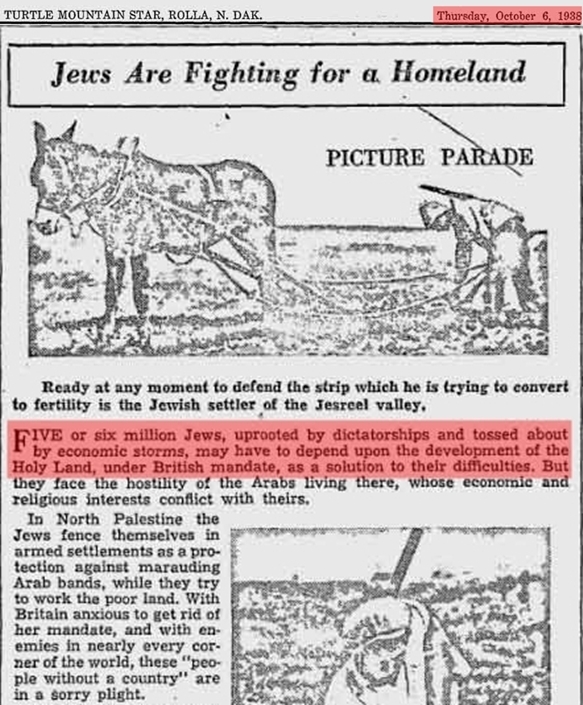 This article references “five or six million Jews uprooted by dictatorships” and calls for them to be settled in the “Holy Land” (Palestine). Poland, under British influence, refuses to concede to Hitler any of his relatively modest territorial demands. Hitler sought to recover the territory stripped away from Germany and given to Poland at the end of WWI; specifically the formerly German city of Danzig. Hitler also demanded an autobahn in the Danzig corridor connecting the German mainland to East Prussia. Poland categorically refused all of Hitler’s somewhat reasonable demands. 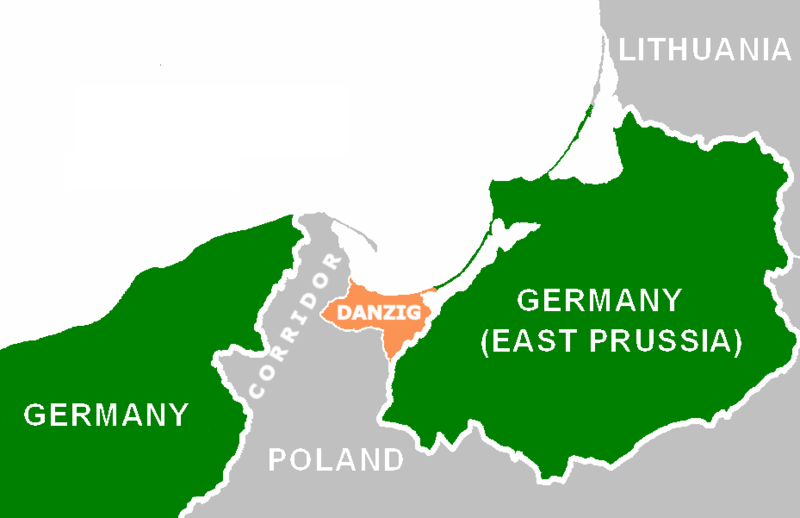 Hitler wanted back the German city of Danzig and an autobahn through the Danzig corridor connecting the German mainland to East Prussia. 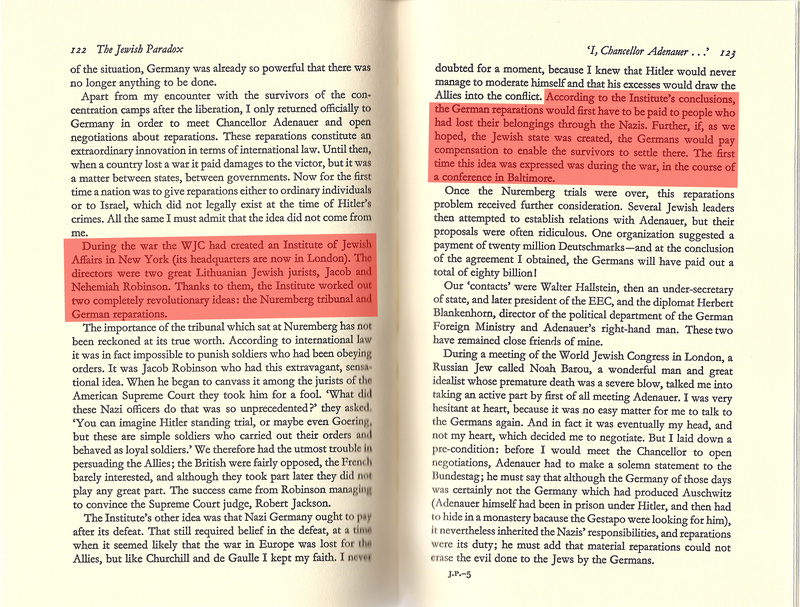 Poland, under British/Jewish direction, refused to acquiesce to Hitler’s modest demands. In September Poland is invaded from the west by Germany and from the east by the Soviet Union. Britain and France immediately declare war on Germany, supposedly because of Hitler’s invasion of Poland. However, Britain and France didnot declare war on the Soviet Union who also had invaded Poland and then attacked Finland a few months later. 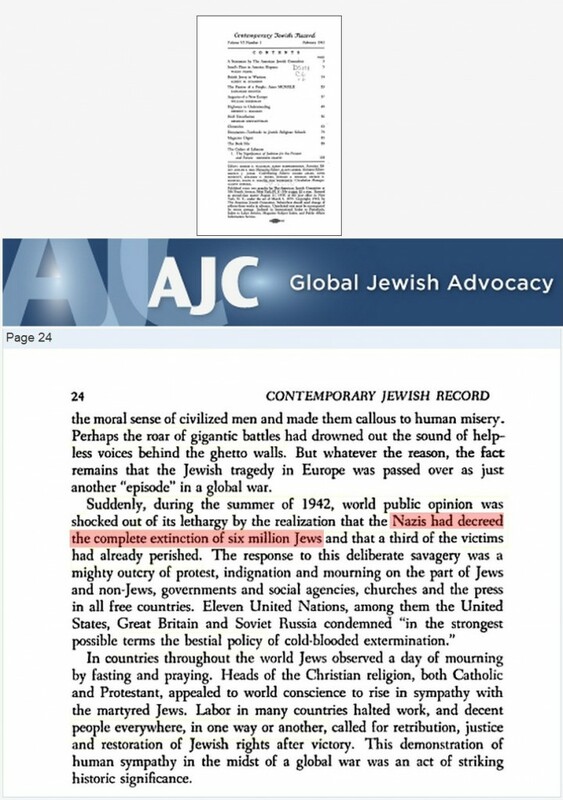 The reason the Allies only found fault with Germany for invading Poland, and not the Soviets, was because the USSR was under Jewish rule, and had been since 1917. The purpose of WWII all along was not to free Poland but to destroy Germany, who had broken loose from the grip of the Jews. 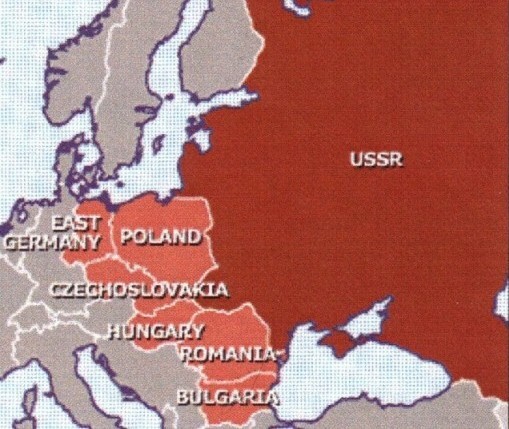 The Allies, who originally claimed to be concerned for Poland’s sovereignty, dumped Poland, along with the rest of Eastern Europe, off to the Soviet-Communist butchers at the end of the war! This Allied betrayal proves that the Allies never cared about Poland at all. Poland was nothing more than a pawn used by the Allied warmongers to sucker the Third Reich into a war. The Allies, who waged war on Germany in 1939 using as a justification the excuse that Germany breached Polish sovereignty by invading, DUMPED Poland off to Stalin and the Communist butchers who had murdered 22,000 Poles in the Katyn Forest in 1940! 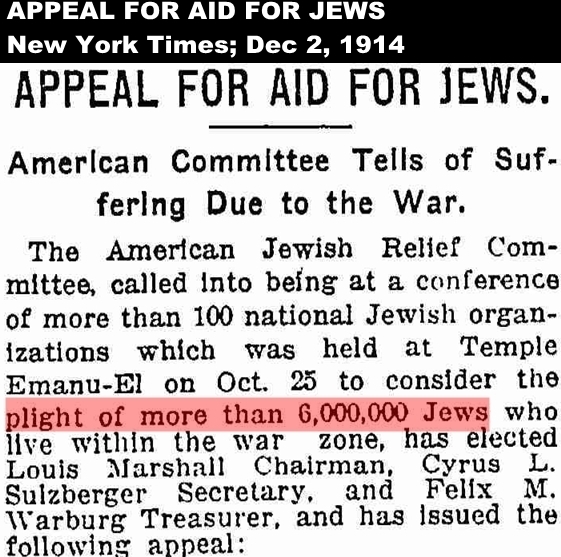 Meanwhile Jews were whining about “Six Million” helpless victims in February, seven months before the war even started. More “six million” references from this paper. 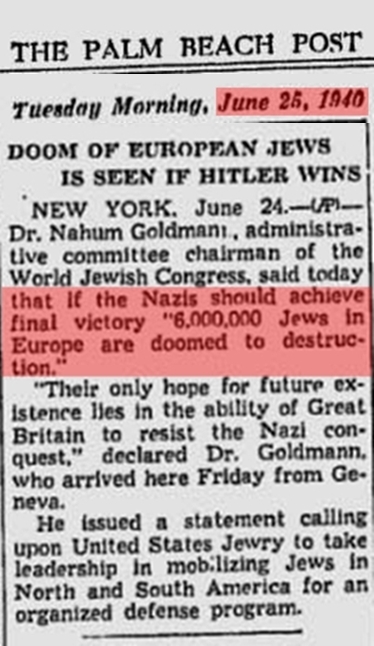 British Jew, Victor Gollancz, predicts 6,000,000 Jewish deaths. 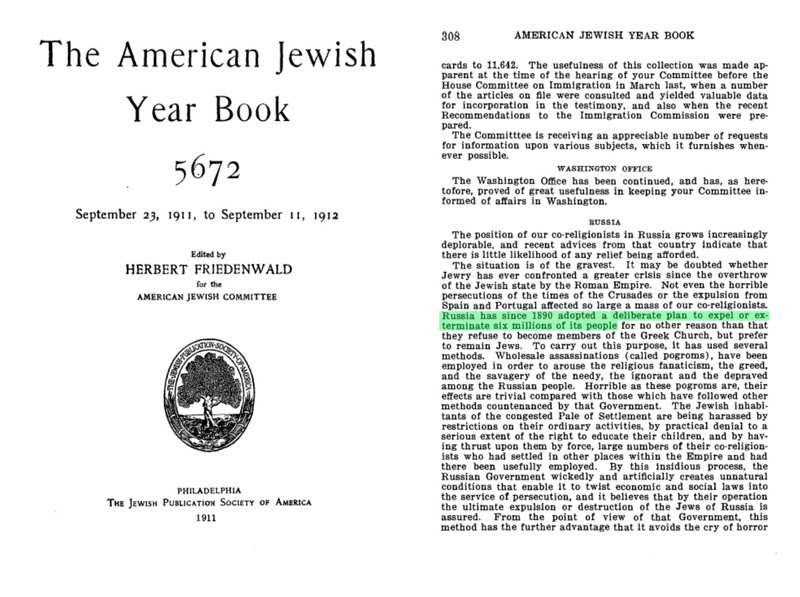 A Zionist organization, The American Jewish Committee, claims the Nazis had set in motion a plan to kill 6,000,000 Jews. 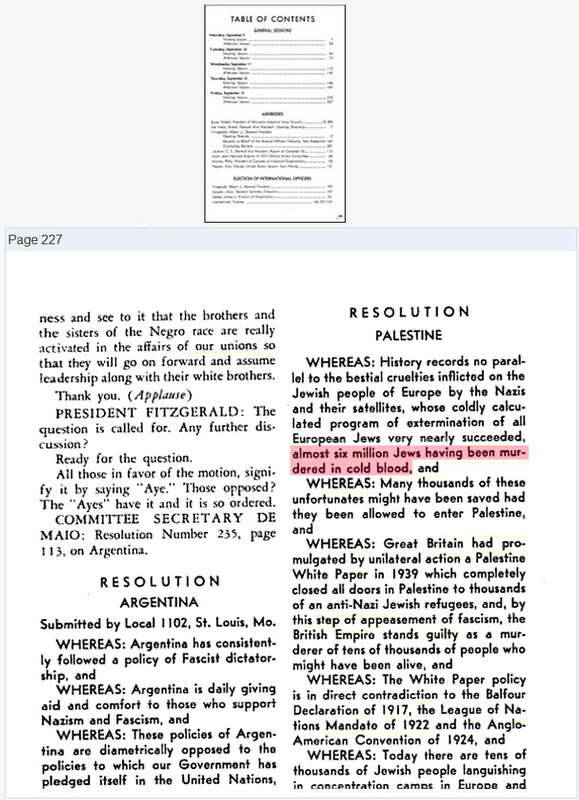 Zionist propaganda build up nearing the end of the war. During the Nazi offensive on the eastern front, German soldiers discover the mass graves of some of the 22,000 Polish military officers and intelligentsia who were murdered and then buried in mass graves in the Katyn Forest by the Soviets in 1940. The insidious Allies knew their “gallant Soviet ally” was a mass murderer but kept quiet about it. 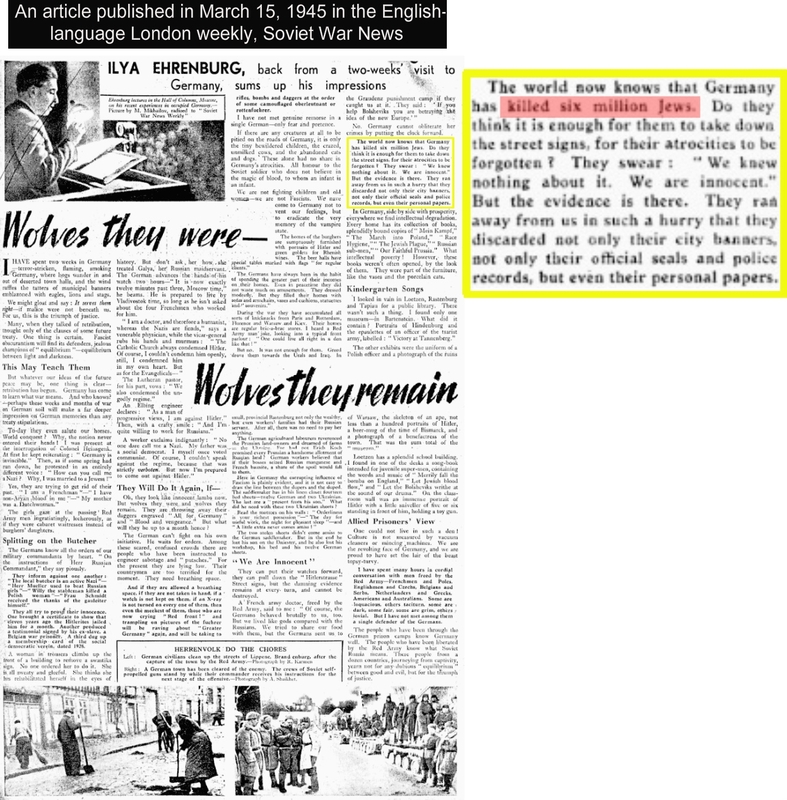 When it could no longer be kept hidden from the public they then tried to blame the atrocity on the Germans! 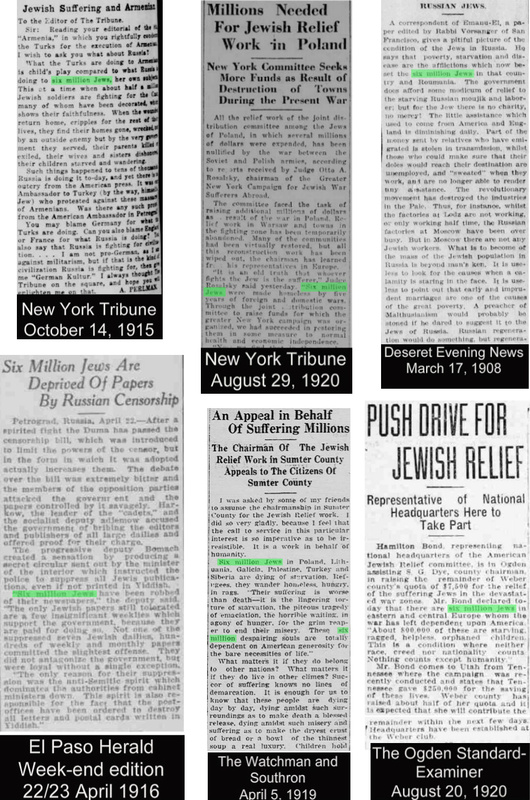 The New York Timesreports that Jewish groups were urging the governments of Britain and America to launch gas attacks against the Nazis. 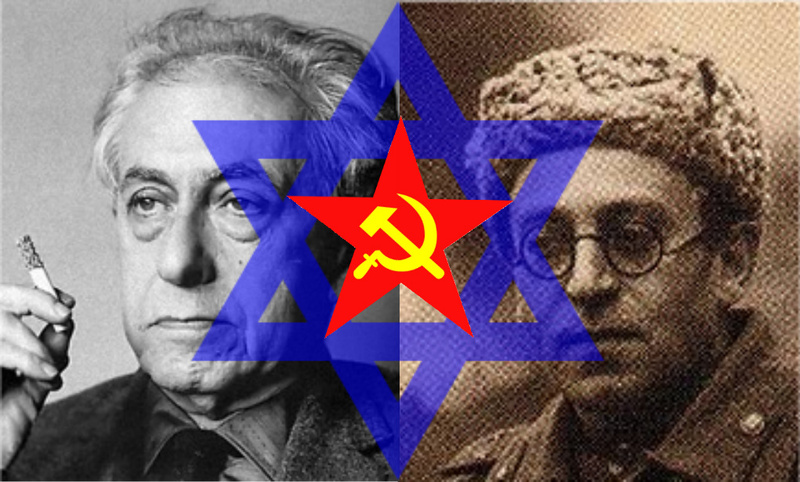 Communist Jew demons, Ilya Ehrenburg and Vassily Grossman. 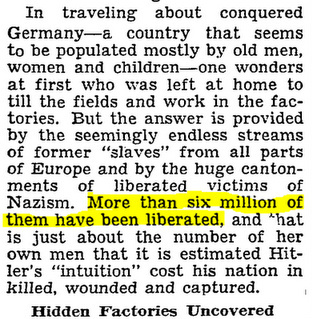 The revisionists estimate that the combined death toll in all German concentration camps was somewhere between 300,000 to 500,000. 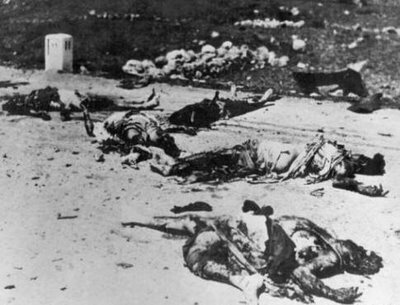 Of that amount about half the victims were Jews. 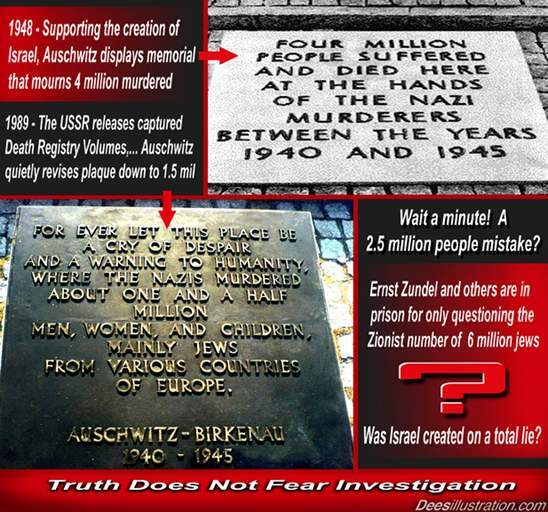 Unlike the comical and discredited “6,000,000″, this figure is based on solid documentation, including the reports released by the International Red Cross who inspected the camps, the Auschwitz death registries released to the Soviet archives in 1990 (which recorded only 69,000 deaths in Auschwitz), and other evidence. 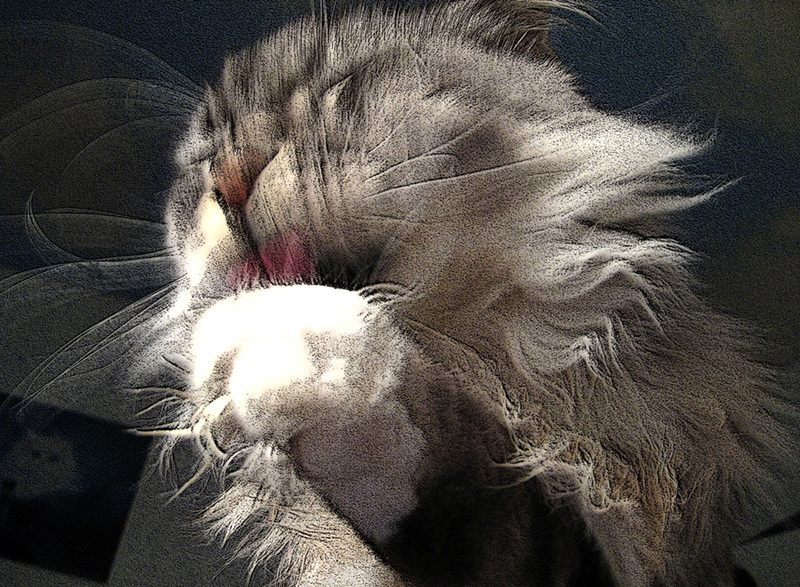 The main cause of death was the typhus epidemic and starvation. 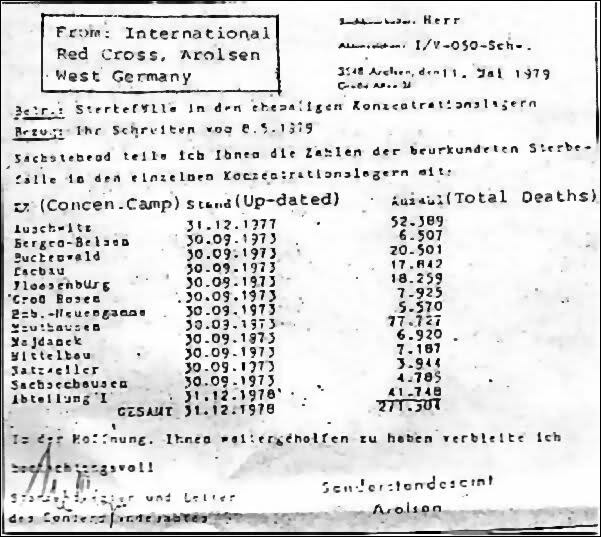 A report from the International Red Cross Tracing Service that tallied a total of just under 300,000 German concentration camp victims. Main cause of death: Typhus. 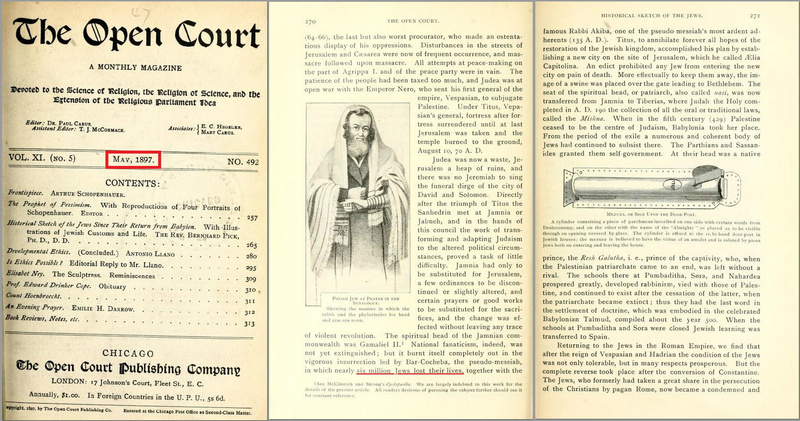 This 1897 “Science of Religion” American magazine, claims nearly six million Jews were killed in the Bar Kokhba revolt 132-136AD.